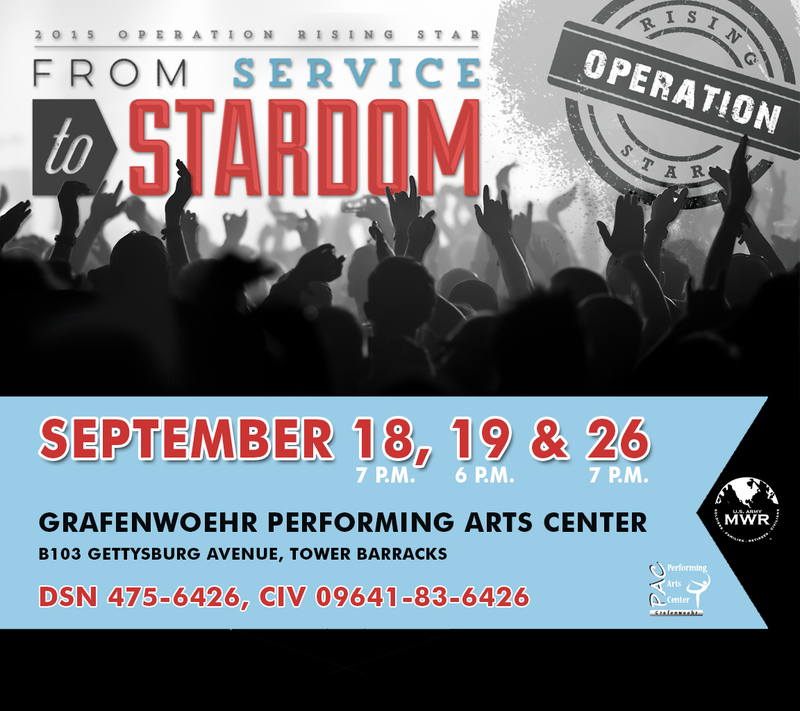 GRAFENWOEHR, Germany — IMCOM, Family and MWR Programs is excited to announce the 2015 Operation Rising Star competition, an individual vocal competition that helps demonstrate the Army’s commitment to high-quality programs that support readiness and resilience. Begun in 2004, Operation Rising Star is a singing competition similar to reality TV show American Idol. The competition begins here at the garrison level. The first place winner qualifies for international competition in San Antonio, Texas, where contestants compete for an all-expense-paid trip to record a 3-song CD. Operation Rising Star competition at U.S. Army Garrison Bavaria will be held at the Grafenwoehr Performing Arts Center on Tower Barracks. Local competition begins with the preliminaries Sept. 18 beginning at 7 p.m. The semifinals — coupled with the Comedy of Champions Show — is Sept. 19 at 6 p.m. The finals are Sept. 26 at 7 p.m. USAG Bavaria;s first-place winner qualifies to compete in San Antonio, Texas, Nov. 29. Local contestants must make it through the preliminaries and semi-finals. The USAG Bavaria 1st-place winner earns $750 and qualifies for international competition in San Antonio, Texas, where contestants compete for an all-expense-paid trip to record a 3-song CD. The 2nd-place wins $350 and the 3rd-place winner earns $200. A sprit award in the amount of $300 will be awarded to the Family Readiness Group or unit demonstrating the most spirit. Applications are available now at the Grafenwoehr Performing Arts Center. You can also download the contestant application form here. Turn in your application to the Grafenwoehr Performing Arts Center by Sept. 17. Contestants must be Active Duty, National Guard or Reserve from any branch of service, or a family member of any of the above groups, eighteen years or older (contestants must be 18 years or older by November 6, 2015), with valid military I.D. card. Active Duty service members only can enter into the online portion of the competition. Military contestants may not have any adverse actions pending. Service members whose records are flagged or with UCMJ actions may not compete. Contestants must be in an amateur status and not perform professionally (i.e. have a current or previously managed recording career). Soldiers currently assigned as a vocalist to a military performance band are ineligible to participate. Contestants who have placed in the top twelve of prior Operation Rising Star Army-wide Finals are not eligible to compete. Get your extra practice in by performing live at MWR’s Jamoke session Sept. 12 at the Grafenwoehr Performing Arts Center. Inquire about GPAC’s sound-proof rooms and the assistance they can provide you. Visit the Grafenwoehr Family and MWR website or the U.S. Army MWR Operation Rising Star website for more.